When I pray my Rosary tonight I’ll be using this rosary. I have many rosaries, from all over the world and representing different milestones in my spiritual journey. All are special. 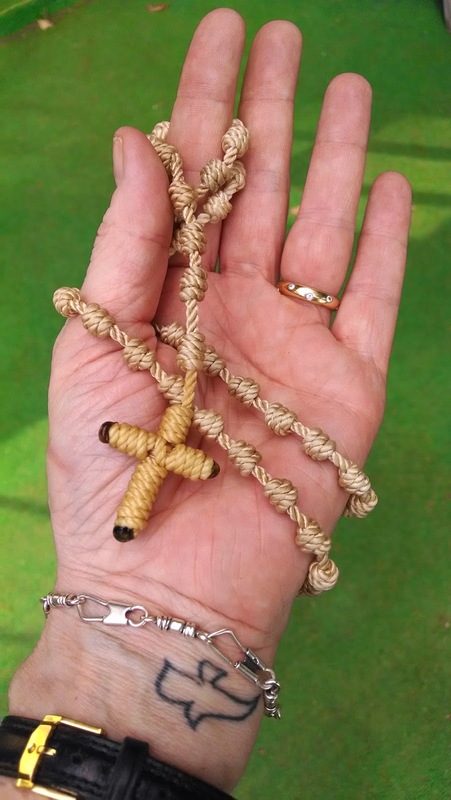 This one is extra special because it’s a paratrooper’s rosary, made from nylon parachute cord. And it was made for me by a World War II veteran who made eight combat jumps behind enemy lines, including D-Day. He also fought with the infantry in the Battle of the Bulge. The veteran was Brother Christopher Danz, a monk at Assumption Abbey, the Trappist monastery near Ava, Missouri, where my brother was a novice with the order in the mid-90s. Brother Chris was a tall, slender, dark-haired man of few words and broad smiles. If I can find a picture I’ll scan it and post it. Sunday afternoons are the monks’ time off for rest and relaxation after a long week of work and prayer. Typically they awaken at 3:15 a.m. for the office of Vigils, followed by Mass, a day of scripture study, meditation, community prayer, and work. (They support themselves by baking and selling excellent fruitcakes.) Some monks work in the gardens, the kitchen, or the guest house, and they are mainly in silence while at work. Over a two week period they will sing all 150 Psalms. When I’d visit the monastery they would come to the guest house to hang out and socialize after Sunday lunch, and Brother Chris always brought his guitar and harmonicas. We’d sing hymns, Woody Guthrie songs and what Chris called “hillbilly music.” The other monks would all tease my brother with the question “Brother Mike, why can’t you sing like your sister?” During one visit, Chris gave me one of his harmonicas after trying to teach me how to play it. I never mastered it, and it’s now in the safe keeping of Barry Landry, who sometimes plays it in our church choir. Brother Chris didn’t talk about the war much–I learned about his accomplishments from the other monks. It was obvious to all that the war had a terrible impact on him. We knew he lied about his age to enlist at 16 or 17, and had just turned 19 when the Allies invaded Europe. When the war was over and he was discharged from the Army he immediately entered the monastic life. He had been at Assumption Abbey from the beginning, and spent his entire adult life after leaving the Army in prayer and meditation. Chris kept the horrors of war to himself, but was known for his devotion to Our Lady of Sorrows. 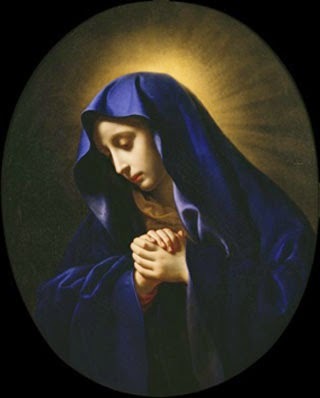 Undoubtedly seeing so many young men struck down in battle caused him to identify with our Lord’s blessed mother, who had to watch her son die horribly on the cross. She heard the Prophecy of Simeon (Luke 2: 34, 35) and personally witnessed her son’s passion and death. Mothers of WWII soldiers had to wait for news via radio, newspaper and newsreel. The really bad news came by telegram. Brother Christopher’s answering the call to a life of silence, prayer and work in community with other monks was also probably reparation and penance for whatever he had to do to survive the hell of the battlefield. 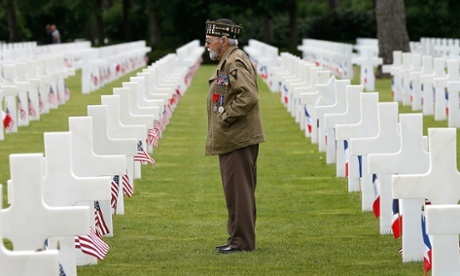 PTSD and survivor guilt were real but undiagnosed traumas of WWII veterans, and some coped better than others. Chris coped through a life of sacrifice and prayer. While the monks were pretty aware of what was going on in the world–they had one computer with an Internet connection, and subscribed to several daily newspapers in order to know what and whom to pray for–most, especially Brother Chris, really had no idea about popular culture. So on one visit, while sitting in rocking chairs on the guest house patio, I told the monks about former President Bush’s parachute jump to celebrate his 75th birthday. Chris was flabbergasted. “Why would anybody jump out of a plane if they didn’t have to?” (A question I often ask myself.) My brother (a former Marine aviator) and I explained about new parachutes, and the ability to steer them. Pointing to the yard in front of the monastery Mike said “Those jumpers are so good they could land right out there.” Chris was amazed. 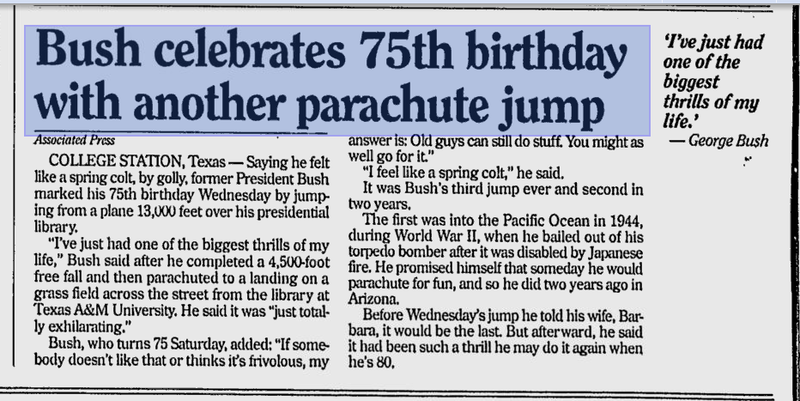 We explained that President Bush did a tandem jump, strapped to an expert jumper, and Chris started to get interested. The Abbot jokingly suggested they plan such a jump for the monastery’s July 4 picnic, to which they invite the whole community. I could tell Chris was fascinated by the idea of jumping out of a plane for fun, without getting shot at, and with a pretty decent idea about where he was going to land. But that was as close as we came to getting him to talk about the war. I think about Brother Christopher often. He passed away a few years back, and is now at peace after a life of keeping the pains of his war experience between him and God. Watching the many documentaries and stories about today’s 70th anniversary of D-Day prompted me to pull out a few pieces of war-time memorabilia. Daddy didn’t see combat during WWII–he was injured during aviation cadet training, developed osteomyelitis in his foot, and spent more than three months at Brooke Army Medical Center in San Antonio as a guinea pig for a new drug, penicillin. Once he regained his health he spent the rest of the war as a B-29 mechanic based in Tucson. Daddy had this Army-issued pocket-sized New Testament, which was presented to every Christian soldier in those days. (This one was printed by John C. Winston Co.) Looking at it and holding it I can’t help but think every soldier storming the beaches of Normandy probably had one in his pocket. 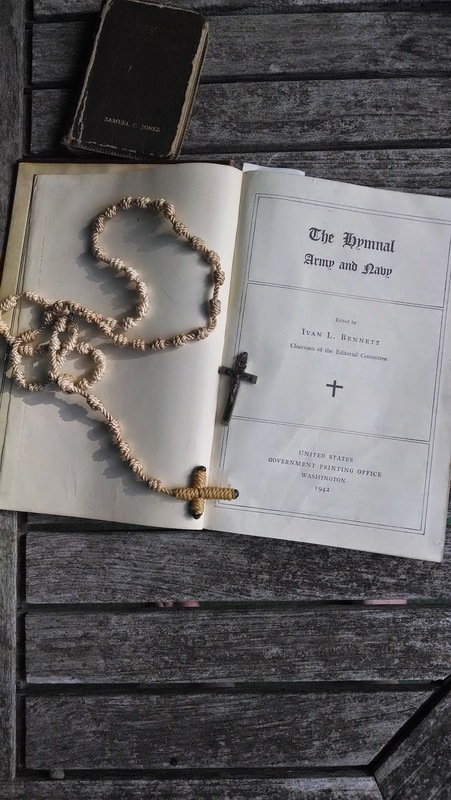 We also have my father-in-law’s Army/Navy Hymnal (Remember, the Air Force as we know it was part of the Army until 1947, and the Marines are part of the Navy). In addition to hymns it has sections of prayers labeled Protestant, Catholic, and Jewish, with selected scriptures and Psalms. It’s fragile, but I love looking through it. I can visualize chaplains blessing the troops before going into battle, and perhaps the soldiers singing familiar hymns for comfort before the invasion. Last but not least among my dad’s religious memorabilia is a small crucifix, origin unknown. It’s made of unknown metal with inlaid wood, and the Body of Christ is brass. My dad didn’t become Catholic until about 1960, but Mom said he always treasured that crucifix, carrying it with him in a B-29 during combat missions over Korea. She couldn’t recall who gave it to him, and he never talked about it. My dad’s war experiences are nowhere near as dramatic as those of the brave men who stormed the beaches of Normandy or battled on the sands of Iwo Jima. But holding these remnants of his past bring me closer to him and to all those of the Greatest Generation who went before us and to whom we owe an enormous debt of gratitude. Freedom isn’t free. Bless the souls of all who paid the ultimate price for our freedom.